Get ready to follow the yellow brick road to Main Street Youth Theatre this summer for the delightful presentation of The Wizard of Oz. 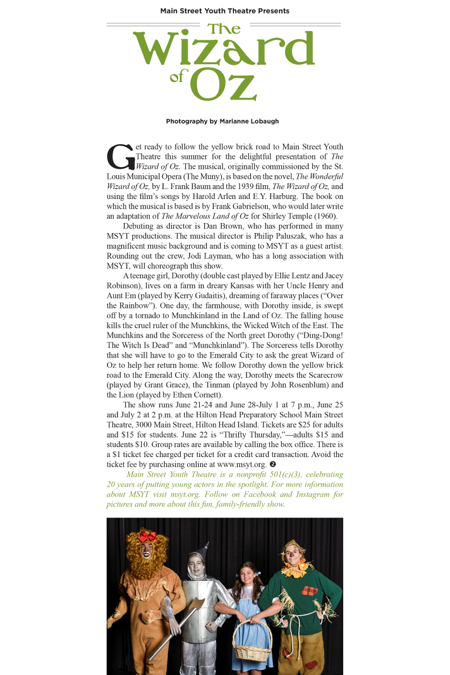 The musical, originally commissioned by the St. Louis Municipal Opera (The Muny), is based on the novel, The Wonderful Wizard of Oz, by L. Frank Baum and the 1939 film, The Wizard of Oz, and using the film’s songs by Harold Arlen and E.Y. Harburg. The book on which the musical is based is by Frank Gabrielson, who would later write an adaptation of The Marvelous Land of Oz for Shirley Temple (1960). Debuting as director is Dan Brown, who has performed in many MSYT productions. The musical director is Philip Paluszak, who has a magnificent music background and is coming to MSYT as a guest artist. Rounding out the crew, Jodi Layman, who has a long association with MSYT, will choreograph this show. A teenage girl, Dorothy (double cast played by Ellie Lentz and Jacey Robinson), lives on a farm in dreary Kansas with her Uncle Henry and Aunt Em (played by Kerry Gudaitis), dreaming of faraway places (“Over the Rainbow”). One day, the farmhouse, with Dorothy inside, is swept off by a tornado to Munchkinland in the Land of Oz. The falling house kills the cruel ruler of the Munchkins, the Wicked Witch of the East. The Munchkins and the Sorceress of the North greet Dorothy (“Ding-Dong! The Witch Is Dead” and “Munchkinland”). The Sorceress tells Dorothy that she will have to go to the Emerald City to ask the great Wizard of Oz to help her return home. We follow Dorothy down the yellow brick road to the Emerald City. Along the way, Dorothy meets the Scarecrow (played by Grant Grace), the Tinman (played by John Rosenblum) and the Lion (played by Ethen Cornett). Main Street Youth Theatre is a nonprofit 501©(3), celebrating 20 years of putting young actors in the spotlight. For more information about MSYT visit msyt.org. Follow on Facebook and Instagram for pictures and more about this fun, family-friendly show.